You can judge a university by its mission statement and the vision statement of Davao Medical School foundation, Davao, Philipinnes is to impart good health to mankind, and that speaks volumes about the core values of the institution. The top ranking university dotting the medical landscape of the davao city in the Philippines trains the best doctors that the science has to offer which can relieve people from illnesses. They have a well-structured syllabus which attracts hordes of medical aspirants from all over the world, especially India. This has been possible because of the handpicked teaching personnel in the university, bringing the legacy of trust and quality alive. 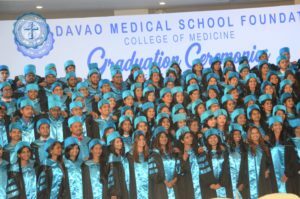 Year after year thousands of well-trained medical professionals are gifted to the society by Davao Medical School Foundation, which is a huge accomplishment. Limra Educational Consultants are there official Indian partners and they are of the view that Davao medical School is offering excellent learning at a comparatively low fee structure, which the guardians of the wards consider worthwhile and are satisfied to get value for money. With the span of the course being 5-6 years there is no demand for capitation fee/donations, with transparency in transactions. Indian students prefer this university because the curriculum offered is up to date with the market requirements with an immense international exposure which definitely do wonders to their self-confidence. English being the medium of instruction there is no need to learn a new language and the student patient ratio is almost perfect as they are associated with Brokenshire Memorial Hospital, Southern Philippines Medical Center and San Pedro Hospital at Davao.